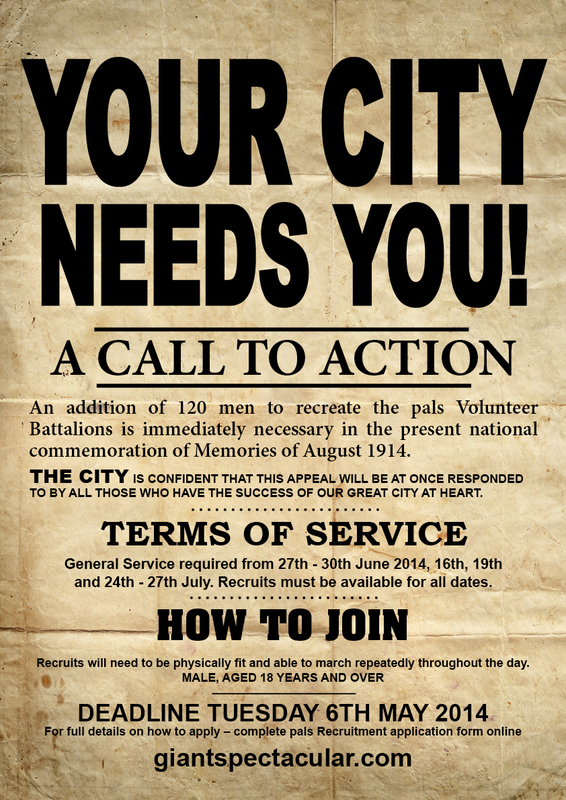 CALLING all recruits – the Giants need you! A massive call out has gone out for volunteers for this year’s biggest street theatre event and now 120 people have the chance to be part of the show itself. For the first time in its 21 year history of producing jaw-dropping giant events, the company behind the theatrical spectacle, Royal de Luxe, is asking members of the public to play a central role in their production. Although the full story is yet to be revealed for Memories of August 1914, part of it will focus on the recreation of the recruitment of the Liverpool Pals battalions, which 100 years ago saw men volunteer alongside their family members, neighbours and work colleagues, signing up to defend Britain on the battlefields of Europe. be physically fit as marching repeatedly will be required. The deadline for applications is 10pm Tuesday 6 May. For full details on how to apply visit www.giantspectacular.com/getinvolved and fill in the Liverpool Pals Battalions re-enactment volunteer application form. Founder and Artistic Director of Royal de Luxe, Jean Luc Courcoult, said: “We put our heart and soul into these shows and it’s hugely important for us that our giants tell a story which resonates with the city they are exploring. “Liverpool has such a rich history and the Pals is an incredible and inspirational part of that – and one that we had to incorporate in the show. When we looked at developing the idea, we decided we must recruit an army, and there was no doubt in our minds that we wanted it to be made up of people from Liverpool. Tony Wainwright, Secretary of the Liverpool Pals Memorial Fund, said: “We are delighted that Royal De Luxe have chosen to incorporate the story of the formation of the Liverpool Pals in the production Memories of August 1914. “The Liverpool Pals story is a remarkable one. Following Lord Derby’s promise that Liverpool would provide one battalion of men from the business community of Liverpool, the response was overwhelming. Between August and November 1914 not one but four battalions were formed and there were enough volunteers to form two reserve battalions. They went on to distinguish themselves during the course of the war, seeing action in some of the fiercest battles. “Sadly over 2800 men fell in action and never saw the peace for which they gave their lives. On 31 August 2014 a memorial will be unveiled in Lime Street station. The date is significant, being 100 years to the day of the first volunteers signing up at St Georges Hall to join the Liverpool Pals. To keep up with the latest news ‘like’ the Giant Spectacular page on Facebook, follow @giantspectacular on Twitter or visit www.giantspectacular.com.